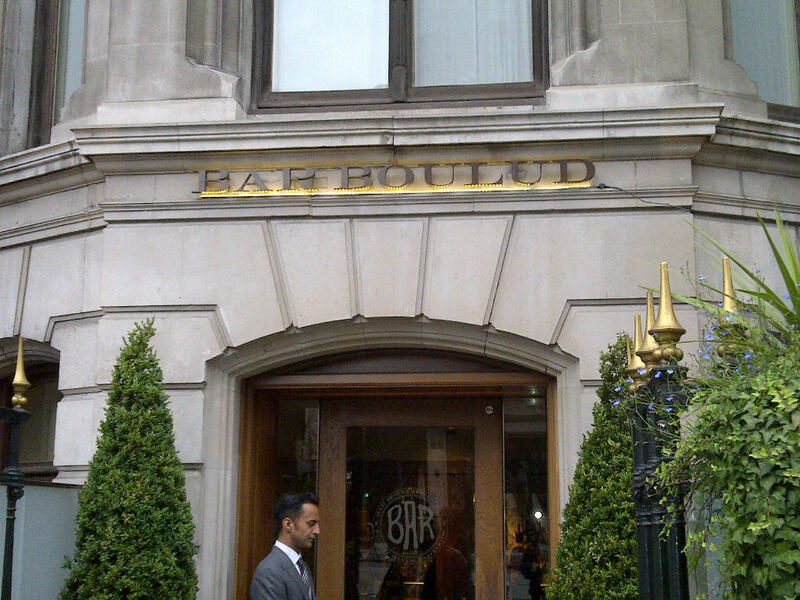 Home » ★★★☆☆ » Bored at Bar Boulud. I’ve heard C bang on for years about Boulud in New York and how brilliant it is but I’m always a bit wary of the Ramsay-esque spread of sleb-chefs and so I hadn’t rushed to try it. You get there through a side entrance for the Mandarin Hotel, which is a good thing as it feels like a separate restaurant, not a hotel dining-room sort of place, at least it does when you first walk in. We were doing the 6.15 pensioner special. I was delighted to see that between the hours of 5 and 7pm there was a 3 course menu for £23 but having satisfied myself that there was a good value option, I obviously then chose to ignore it. As you do. Kir was. I hadn’t had my mouth full or taken my teeth out or anything. Really. There is no excuse. And then, when she came back with the menu, after a minute, she asked if we needed any help with it. I said no, thanks, we’re just looking, so obviously ;she proceeded to entirely ignore that and go through the specials in laborious detail. I didn’t have the heart to tell her to stop and I wondered whether, in fact, ;she had a hearing defect. Lots of choice on the menu. Big on shellfish and steaks and lots of daily specials. One vegetarian option amongst all the animal protein, which was a bit poor given the length of the menu in other respects. And I think that perhaps the menu is a tad over ambitious and that there is simply too much choice. ;I always worry about that. And we ordered. Shellfish aioli for me at £13. Other thn it took 40 minutes to arrive, which is just unacceptable for an assembled plate and a half-empty restaurant, it was very pretty but a little too cold, so the flavour of the vegetables was lost. 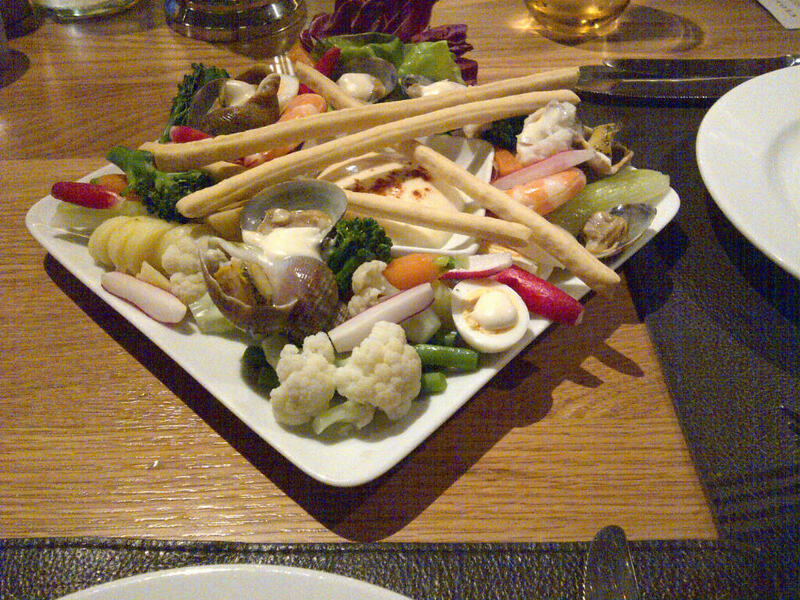 More to the point, quite a lot of the shellfish consisted of big fat sea snails. Maybe it’s me and I’m a fussy old bag but I think that they are a bit of a minority interest and I would have liked a warning. No one asked me why I’d left most of the plate. I’d have said. Maybe they never get eaten and move from plate to plate. And then C had the Boulud Burger. He said it was the best he’d had in London. I’m glad he was so happy. I chose a sea bass, on a bed of green beans, with roasted fennel and fennel salad. ;The fish was fine as was the roasted fennel. The fresh fennel with orange was not dressed and looked like it had been thrown on the plate. I mean, don’t get me wrong; it all tasted fine but it just lacked a bit of finesse in the finish. And for £24 without service I feel it should be plated up with a bit more care. The desserts all looked quite elaborate. I nearly ordered a souffle but C reminded me that I was trying to cut back, which was indeed ;a most welcome reminder and one for which he received much thanks. How did a bottle of mineral water, 2 beers, a Kir a starter, two main courses- one priced at £11 or thereabouts (-fries extra) turn into a few pennies under £90? That will remain one of life’s great mysteries. However lovely the burger, I can’t see myself going back. I was entirely underwhelmed. I didn’t feel the restaurant had any real identity. No-one seemed to care very much and it seemed to be populated by tourists and Kensington women in skinny jeans and Chanel jackets, who didn’t seem that interested in the food. I just didn’t get the impression it was a happy place, just your average hotel brasserie. If you want that, go to Koffman’s across the road. That’s how to do it. Couldn’t agree more; was also entirely underwhelmed with Bar Boulud and until now thought I was the only one!